The next time you and your family are in Denver, you should consider checking out the Denver Children’s Museum. 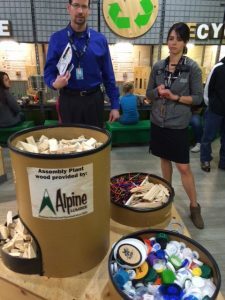 Alpine Lumber has been a supporting partner of the museum since 2012, supplying all of the wood used in the children’s workshop area. The children can use several different hand tools and with our supplied wood, can construct many projects from plans created for young children of all ages. Our wood is made available in the center section of the workshop area dispensed from a container proudly displaying our Company logo. The two individuals shown in the picture are museum staff who provided our Alpine team with a facility tour.